I receive a sms yesterday from Clarins. Quite sudden that they're having a warehouse sale this weekend starting tomorrow (Friday) until Saturday. It was normally held around August for the past couple of years but this year in May. Not only that, metrojaya, anna sui, etc all around this time! why why. I think I will have to skip this sale as I've already overspend on Stila. Goodbye shower gels, goodbye face serum. They sell brush sets here too fyi! 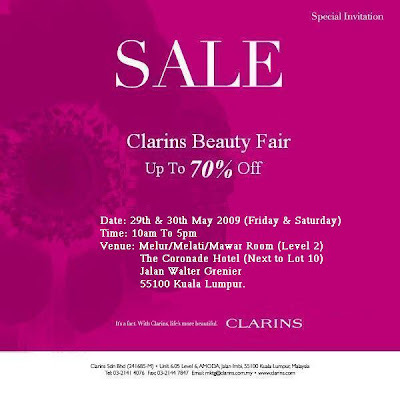 Check out my previous report on Clarins Beauty Fair in 2008 here. hi miu, i m so amazed with the warehouse sales...u know what, ive not been to any since i m staying in ipoh. do u think u can inform me of these sales in future so i can make arrangements to go?? emails on channel advisor's blog on thursday. article, you'll be described as a believer paydayloansonlinedurp.co.uk in any important situation it is vital that you simply understand exactly what you happen to be managing along with the material in question.